From the “Home” tab , tap/click the phone’s Menu key, and then tap Settings. To change checked settings, tap the checkbox(es) to unselect. To select unchecked settings, tap the checkbox(es). Tap down arrows to customize settings with multiple options. “Bluetooth” (defaults to enabled/checked); to disable Bluetooth for Enhanced Push-to-Talk, tap the checkbox. 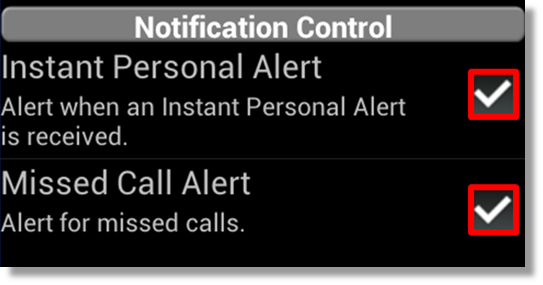 “Vibrate Alert” (defaults to enabled/checked); to disable vibration for Enhanced Push-to-Talk alerts, tap the checkbox. 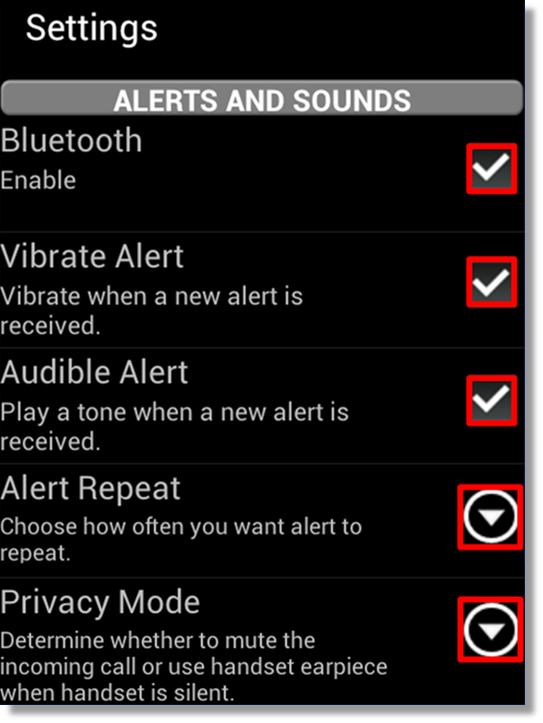 “Audible Alert “(defaults to enabled/checked); to disable alert tone for Enhanced Push-to-Talk alerts, tap the checkbox. 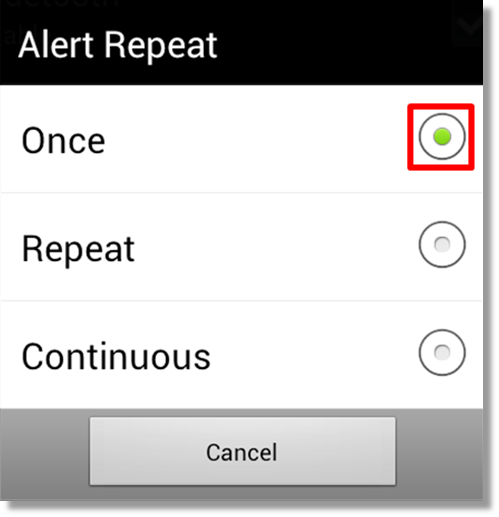 “Alert Repeat” (defaults to once); tap the down arrow, and then tap the radio button to select “Once”, “Repeat”, or “Continuous”. 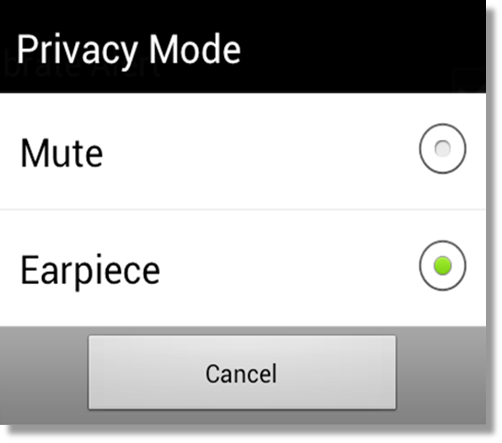 “Privacy Mode” (defaults to earpiece); tap the down arrow, and then tap the radio button to select “Mute”, or “Earpiece”. “Instant Personal Alert” (defaults to enabled/checked); to disable, tap the checkbox. “Missed Call Alert” (defaults to enabled/checked); to disable, tap the checkbox. “Show Avatar” (defaults to disabled/unchecked); to enable, tap the checkbox. 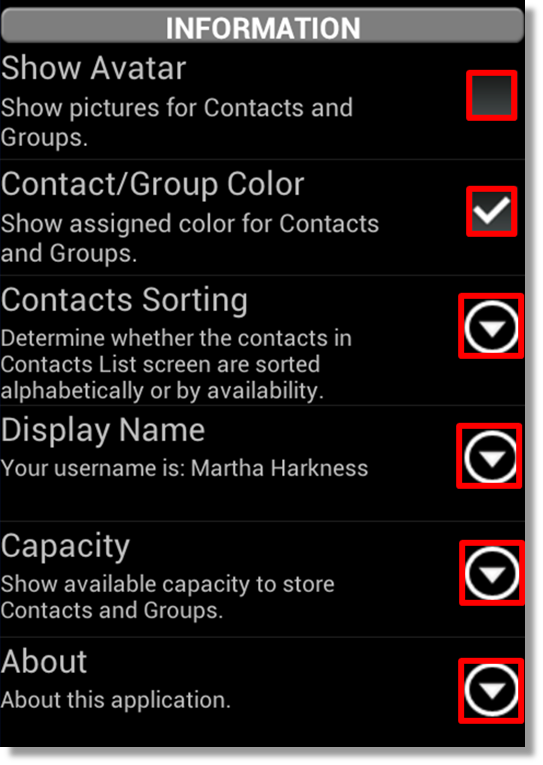 “Contact/Group Color” (defaults to enabled/checked); to disable, tap the checkbox. 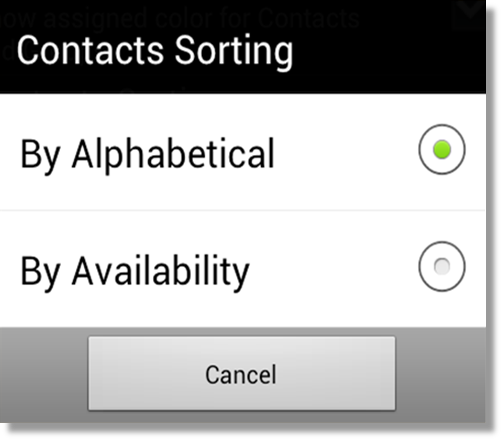 “Contacts Sorting” (defaults to alphabetical); tap the down arrow, and then tap the radio button to select “By Alphabetical”, or “By Availability”. “Display Name” (defaults to ATT); tap the down arrow, type desired display name and then tap “OK“. 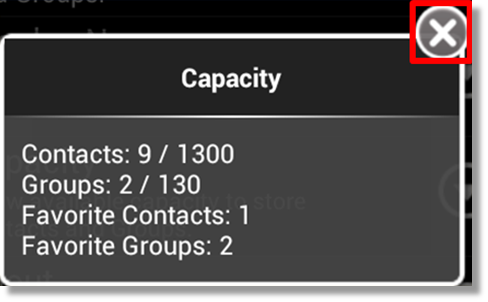 “Capacity” To display current Enhanced Push-to-Talk capacity, tap the down arrow to view, and then tap the “X” to return. 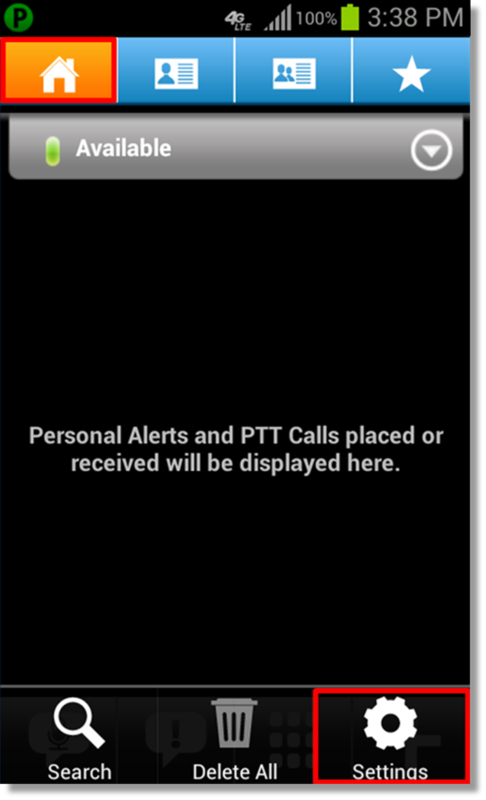 “About” To display additional information about the Enhanced Push-to-Talk application, tap the down arrow to view, and then tap the “X” to return. “Show Tutorial” Tap the down arrow to launch the Enhanced Push-to-Talk tutorial in the browser. 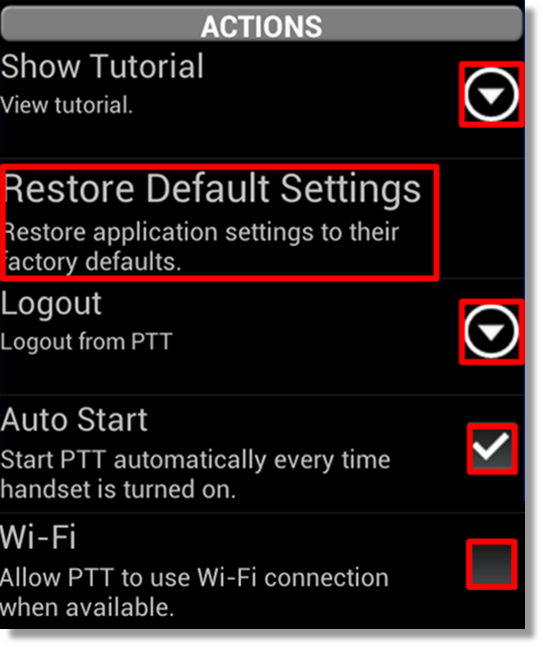 “Restore Default Settings” To restore all settings to default, tap Restore and then tap Yes to confirm. 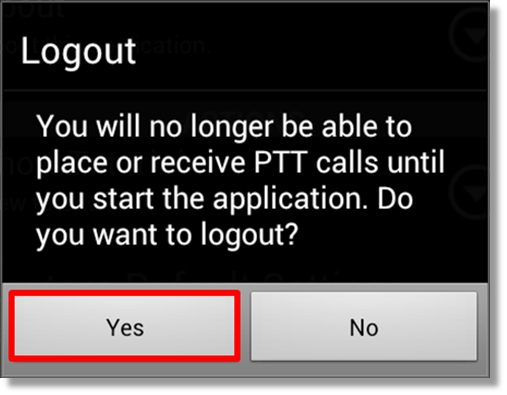 “Logout” To log out of the Enhanced Push-to-Talk application, tap the down arrow, and then tap Yes to confirm. 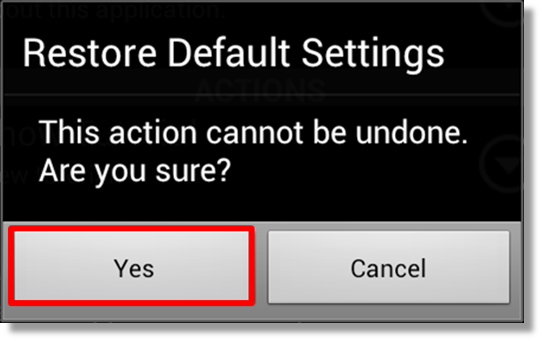 “Auto Start” (defaults to enabled/checked); to disable, tap the checkbox. “Wi-Fi” (defaults to disabled/unchecked); to enable, tap the checkbox. When you are done, tap/click the phone’s Back button to return to the “Home” tab .